This high design, bamboo bento box update holds leak-proof, modular containers for flexible meal options. That jumble of plastic containers you carry your lunch in? Toss 'em in the donate pile, because this intelligently designed system is taking over. Traditional bento boxes have fixed, open compartments. 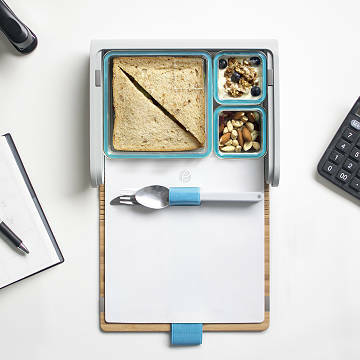 The elegant update has leak-proof containers, stainless steel cutlery, and an integrated silicone eating mat. The accompanying app is filled with recipes by professional chefs and nutritionists, tailored to fit a broad range of diets and tastes. All that lunchspiration will have you eating healthy, portion-controlled meals on the daily. Designed in Los Angeles, California. Made in China.